While liberals and many libertarians unite against building or maintaining general-purpose lanes to improve traffic flow, the typical American suffers. Even the mighty GPS cannot save you from the Springfield mixing bowl. Located seven miles south of Washington, D.C., this is the confluence of three major highways—I-95, I-395, and I-495—along with several smaller county roads. A hideous tangle of cloverleafs, bridges, and flyovers, the mixing bowl is a traffic factory with so many lanes, exits, and merges that its dysfunction has earned it a Wikipedia page. Trying to make your way through with GPS guidance alone offers perhaps a 50-50 chance of success; the only sure means of navigation is hard-won experience. Part of the confusion stems from the fact that the intersecting highways have both normal lanes and special lanes. The north-south axis (I-95 and I-395) consists of an eight-lane divided highway, with four normal lanes flowing in each direction. Between them sit two special lanes, which are sometimes reserved for High-Occupancy Vehicles (HOV), carrying three or more people, and sometimes open to everyone. The special lanes reverse direction depending on the time and day. Sometimes they flow north, and sometimes south. The east-west highway (the I-495 loop, or Capital Beltway) has its own special lanes, too. They are designated High-Occupancy Toll (HOT) lanes. If your vehicle has three or more passengers and you’ve leased a special kind of E-ZPass transponder, you may use these lanes for free. HOT lane cars with fewer than three passengers or only a regular E-ZPass must pay a toll. This toll varies depending on traffic. You never know how much it will be until you get to the on-ramp. As I said, it’s all quite confusing. The mixing bowl confronts drivers with any number of what transportation engineers call “decision nodes.” Do you have the right E-ZPass? Which way is the traffic moving? How much is the toll today? Will the special lanes have an exit at the place where you want to get off? (Not all exits are available from both the main and special lanes, and the omissions are nowhere marked for drivers.) And all of this excludes the question of the traffic, which, by the numbers, is as heavy as anything you’ll find east of California. The heavy traffic is the reason all of those “special” lanes were built in the first place. And more of them are coming. In the next few months, the north-south HOV lanes will be expanded and converted to HOT. HOT lanes are all the rage in transportation engineering. Over the last few years, they’ve mushroomed across the country: from I-85 in Georgia to I-95 north of Miami; from I-394 and I-35 in Minnesota to I-15 in Utah. California is lousy with them, of course: The I-10, the I-15, and the I-110 all have HOT lanes. There’s even a HOT lane on a lowly state road in California, SR-237. That’s outside of San Jose, and the toll there fluctuates between 30 cents and $6.00 for the privilege of driving a four-mile stretch of road. All told, there are 21 HOT lane projects up and running in America today. More are in the works. HOT lanes have a small, but potent, constituency. Progressives, who reflexively support any measure that makes living in the suburbs more costly—their ultimate aim being to nudge people into dense, urban cores—see HOT lanes as a check on suburban sprawl. On the other side, libertarians view HOT lanes as a perfect instrument of free-market economics, allowing consumers to put a dollar value on their time by choosing to pay their way out of traffic—and in turn fostering smaller government by offloading public responsibility for roadways onto private companies. Both sides are, to a certain extent, correct. HOT lanes are wondrously useful to divergent ideological agendas. The question of whether or not they work is another matter. Traffic has been confounding American transportation planners for better than half a century, ever since the interstate highway system was born under Dwight D. Eisenhower. Interstates not only connected distant urban areas, but made the creation of outer-ring suburbs (and later exurbs) possible. Highways had the effect of making high concentrations of jobs (in the cities) accessible to lower-cost housing (in the suburbs). You could plausibly argue that as much as the birth control pill or television, it was highways that—for both good and ill—made the American way of life possible in the late twentieth century. As people migrated to the suburbs, some highways became congested. Under optimal conditions, a lane of freeway can move roughly 1,800 cars per hour. In places like metropolitan Los Angeles—which combines sprawl with the hard geographic limits of a bounding ocean and a bisecting mountain range—this rate of throughput, as the traffic engineers call it, on the existing freeway lanes proved inadequate. The obvious solution was to add lanes, increasing carrying capacity. But over time, economists and engineers came to believe that adding capacity to the system only made the traffic worse. They contended that adding lanes “induced demand.” Which is to say that building extra lanes only encouraged more people to drive, with the end-state of gridlock being a permanent condition, no matter how many lanes you had. There was never a solid scientific basis for induced-demand theory—in fact, a great deal of research has subsequently rendered it dubious, at best. But that’s beside the point. The specter of “induced demand” was a good excuse to not build more highways, which has been the prime directive of environmentalists, urban planners, and other bien pensants of the administrative state for the last 35 years. At the same time induced-demand theory was making the rounds, conservative economists proposed that the real answer to traffic was pricing. Roadways, they argued, are a classic tragedy of the commons. Because highway travel is free, so many people take advantage of it that it gets ruined for everyone. The economists contended that if use of the highways were priced, people would be forced to put a value on driving and the invisible hand of the market would regulate traffic. At first the economists fixated on “peak pricing,” that is, charging a toll during rush hour. But flat tolls were a crude mechanism. What they longed for was a dynamic system that would always reflect the “true” cost of usage. In 1993, two economists at the Reason Foundation, Gordon Fielding and Daniel Klein, proposed a regime of variable pricing: When traffic was light, the toll might be 50 cents; when traffic was heavy, it might jump to $8. Dynamic pricing would force drivers to pay a true price to avoid traffic. The market would then cause driver economicus to regulate his behavior in the most efficient manner. The creation of cheap, passive Radio Frequency Identification transponders in the early 1990s made dynamic pricing possible. Drivers registered for transponders (such as the E-ZPass system in the northeast, or SunPass in Florida) that were tied to a credit card. Tolls could be collected electronically while the car was moving. With the problem of collection solved, adjusting prices on the fly was easy. All that was needed was a system of sensors at on-ramps and exits to track the movement of vehicles within the network and a computer algorithm that could raise or lower prices so that traffic volume in the HOT lanes was kept moving at some predetermined minimum speed, say, 50 mph. The first HOT lanes in America, on SR-91 in Orange County, California, opened in 1995. Six years after Fielding and Klein launched the HOT lane concept, Robert W. Poole Jr. and C. Kenneth Orski became its most formidable intellectual advocates with a piece in the journal Regulation that still serves as the definitive argument for HOT lanes. Poole and Orski began by attacking the HOV concept: HOV lanes, they said, were problematic. Drivers didn’t like them; the environmentalists who’d agitated for them in the first place during the 1970s were having buyer’s remorse; and academic studies suggested they didn’t relieve congestion. Poole and Orski suggested that the big problem with HOV lanes was that they were underused: A freeway lane that could be moving 1,800 vehicles per hour, when marked for HOV, might be moving 400. If those cars held an average of 3 people, HOV lanes were less efficient than general purpose lanes. Further, even if HOV lanes were moving 1,200 cars an hour, they still had latent capacity that was going unused. So Poole and Orski proposed converting HOV lanes to HOT. The appeal of their proposal was simple: In addition to carpooling riders, the express lanes would attract single drivers willing to pay a toll. This would soak up excess capacity in the express lanes, relieve congestion on the main lanes, move all riders faster—and generate revenue to boot. To cover the costs of conversion (or new construction), states could form partnerships with private-sector companies, which meant that the improvements could be made with a minimal tax burden. It was win-win-win. The market would solve everything. Here is how the market solved the Springfield mixing bowl: In 2002 the state of Virginia decided to get into the HOT lane business. It solicited bids to add HOT lanes to the Virginia portion of the Capital Beltway and in 2005 entered into a deal with an Australian company, Transurban, to build HOT lanes along a 14-mile stretch of I-495. The cost was estimated to be $900 million, and the project was to be completed by 2010. At the time of the agreement, the sources of funding for this public-private partnership were, as they say in baseball trades, to be named later. This omission made it difficult to tell whether the Transurban proposal was any good. But then, there wasn’t much basis for comparison anyway: The Australian company was the only bidder. By 2007, when Democrat Tim Kaine was governor, the launch date had been pushed back to 2013 and the project cost had almost doubled, to $1.7 billion. Even so, the private partners generously committed to providing $1.3 billion of the necessary funds. In return, they would be granted a 75-year concession to operate the lanes and would share 30 percent of toll revenues with the state of Virginia. There was, however, some fine print. Revenues would be shared with the state only after all operating costs and project debt had been repaid. The budgetary math suggested this moment would arrive roughly the third Sunday after Never. And it turned out that most of the “private” money would be coming from the public, too. By the end of 2007, the projected cost was up to $1.9 billion—these deals rarely get better as they go along—and Transurban announced that it had secured $1.2 billion in sweetheart loans and “private activity bonds” from the U.S. Department of Transportation and the state of Virginia in addition to the $409 million Virginia had already committed to spending for the cause. In the end, Transurban plunked down just $350 million of its own money. As this game of financial Twister was playing out on the I-495 project, Transurban signed another deal with the Virginia Department of Transportation to begin work on converting the HOV lanes on I-95/I-395 into HOT lanes, too. Your average consumer might have waited to see how the vendor performed on one project before signing on for another. But then, government is not the average consumer, and the singular joy of public-private partnerships is that all money can be seen, after a turn, as other people’s money. The projected price tag for I-95/I-395 looked like a bargain: just $940 million for 29 miles of HOT lanes. And this time Transurban committed to paying a huge chunk of it, $843 million, with Virginia on the hook for only $97 million. Except that nearly $600 million of Trans-urban’s contribution again came in the form of government bonds and loans. And again, no other companies bid on the project. The I-95/I-395 HOT lanes are being built at this very moment. In any event, Transurban was concerned that these carpooling freeloaders would eat into its profits. So the stipulation was inserted that if HOV traffic exceeds a certain percentage of total drivership (24 percent) then the state of Virginia will have to pay Transurban for the carpoolers. How much? Up to 70 percent of the prevailing toll rate for each HOV vehicle. And this provision isn’t just to keep Transurban from going out of business: It doesn’t sunset until Transurban clears more than a 12.98 percent profit from the project. The arrangement is every capitalist’s dream: free land, developed with taxpayer money, for privatized profits and socialized losses. Thus far, the HOT lane experiment on the Beltway has had poor results. The lanes officially opened on November 7, 2012. The original Transurban proposal projected that 66,000 cars a day would use the express lanes; during the first six weeks they averaged 23,308 vehicles per day. Transurban said not to worry—this was just a “ramp up” period. By the close of 2013, a full year into the project, the average number of daily trips was up to 41,327—still nearly 40 percent off the projected pace. On the HOT lanes’ single biggest day ever, only 46,975 vehicles used them. What this means, practically speaking, is that most of the time the HOT lanes sit relatively empty while traffic crawls along in the main lanes. Traffic engineers call this excess capacity. Drivers call it a waste. The intellectual defense of HOT lanes begins with the observation that paying for the use of roads is nothing new. HOT lanes actually represent the third era of American tolling. Back in colonial days, nearly all “pikes” were privately owned toll roads. Then in the 1930s and ’40s, there was a wave of construction of big, state-owned toll roads—the Pennsylvania Turnpike, the Massachusetts Turnpike, the New York Thruway, the glorious New Jersey Turnpike. Seen in this light, HOT lanes and other forms of “congestion pricing” are merely the latest attempt to apply market principles to roadways in order to meet the needs of the moment. And it’s not as if we don’t need more highways. As Reihan Salam noted in a 2013 paper for the libertarian think tank R Street, the cost of maintaining and upgrading roadways to handle their current load in the United States runs to the hundreds of billions of dollars—which most state governments are at present unable or unwilling to pay themselves. Salam argues that road pricing (including both HOT lanes and other schemes) holds some promise. Yet Salam is careful to note that road pricing is no panacea. The Reason Foundation’s Robert Poole—who’s more or less the godfather of HOT lanes in the United States—is equally careful and honest in his advocacy. Poole never claims that HOT lanes are the solution to traffic. Instead, his most persistent argument is that HOV lanes have proven to be wasteful and that research suggests that converting HOV to HOT moves more people more efficiently. There are enough studies to suggest that, in the abstract, this is probably true. Tolls beat carpools. The question is whether in practice HOT lanes are superior to general purpose lanes. 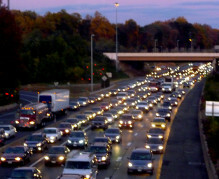 The evidence on this score is mixed, and the anemic ridership on the Capital Beltway in Washington, D.C., isn’t unique. Washington state, for instance, began a pilot HOT program with 10 miles of lanes on SR-167, outside Seattle, in 2008. After four years, revenue was less than a third of initial projections. The best that can be said about HOT lanes is that they may work, in some configurations, in some places—provided the government drives a hard enough bargain and the planning and modeling for the project are sound. Which is fine, so far as it goes. The catch is, adding basic, general-purpose lanes works 100 percent of the time. This is particularly important in the case of the I-95/I-395 project, where the state is giving away two lanes that are open to the general public for 19 hours a day and turning them into HOT lanes full time. The problem with general-purpose lanes isn’t practical, it’s political: Environmentalists and progressives hate them; politicians don’t want to pay for them; and there’s no way for sharp-eyed private companies to extract money from them. Of course the toll express lanes will be used more by those with more money. Only a simple-minded leftist sees that as an argument against them. For a start the wealthy are often very productive people, and if they are prepared to pay their way to avoid congestion then both they and society benefit. Even by the standards of libertarian money-worship, this is strong stuff. Yet populist concerns about HOT lanes aren’t specious. For one thing, citizens should always be wary when the government conveys public land to a private entity. They should be doubly so when the private party gets the land free. And triply so when the private party has no competition for the gift. HOT lane advocates are quick to point out that surveys suggest a wide spread of income among users. Indeed, it seems that most drivers use HOT lanes only occasionally and that “regular” customers are a minority. Even so, the income of HOT lane users does tend to be higher than average, which makes it hard not to see the lanes as a transfer of wealth up the economic ladder. The government gives away public land. It funds the public portion of the construction costs. It provides loans and bonds to the private construction company. And then, once the HOT lanes are operational, it pays for the state troopers who patrol them and the crews who keep the snow off of them. That’s an awful lot of public resources being lavished on a good designed for folks at the higher end of the earnings scale in the name of some nebulous public benefit. It’s a bit like the massive government handouts to electric car manufacturers, such as Tesla, which have had the effect of subsidizing luxury cars for the rich and famous. Only it’s more obnoxious, because when Ben Affleck drives around in his Tesla, he has to sit in the same traffic as you do in your Ford. That is, unless he hops on a HOT lane. In which case your tax dollars will have made his drive both nicer and faster. Yet what makes HOT lanes truly unfair is that they discriminate on price, not value. Think about the economic choice offered to a driver as he approaches a HOT lane on-ramp at the Springfield mixing bowl. At the moment he arrives, both the HOT and main lanes look clear. The HOT sign flashes a price at him. Perhaps it’s $3.85. The key to understanding the nature of HOT lanes is that at that moment the driver has no idea what the price represents. In order to make an informed decision about whether to pay the toll, our driver would need to be able to compare travel times to his destination in both the main and HOT lanes. Obtaining this information isn’t difficult; highway administrators do it all the time. Drive down any stretch of freeway in America these days and you’re likely to see signs estimating travel times to points in the medium distance: Exit 160: 13 miles, 14 minutes. And yet the signs for HOT lanes in Virginia won’t tell you anything about travel times. That “perceived” seems important. What with the no-competition contracts, the government loans and bonds, and the HOV subsidies, HOT lanes have meandered far, far away from free-market principles. And by admitting that they’re not actually selling a good—time—but rather a panoply of intangible benefits, the advocates have gone farther still. In fact, we’ve reached the point where you can see why progressives like HOT lanes as much as libertarians do. For all the talk of pricing and value decisions, in reality, the new Virginia HOT lanes will function something like Obamacare’s-individual mandate: You either sign up to use them and pay the cost of doing so, or you pay a penalty in the form of increased traffic. And the function of this mandate is to discourage a lifestyle—suburban, middle-class living—that both progressives and libertarians find distasteful. Consider a commuter making his way north on I-95 toward Washington at 9:30 in the morning. With the HOV restrictions lifted—they run from 6:00 a.m. to 9:00 a.m. and from 3:30 p.m. to 6:00 p.m.—he can cruise along in the open express lanes. Yet the traffic in the main lanes will continue to crawl slowly until close to noon on most days—because there are relatively few points at which drivers can enter the express lanes. Once the HOT project is complete, however, our suburbanite who has diligently arranged his commute to off-peak hours will no longer be able to use the express lanes for free. Instead, he’ll have a choice: move into the morass of traffic on the main lanes, adding perhaps an hour a day to his commute, or pay the toll for the HOT lanes, which is likely to run somewhere between $1,500 and $2,000 a year. For some people—specifically the kind for whom that sort of money is merely the cost of doing business—this might turn out to be an improvement. For the median household, it will be the imposition of either a financial or a temporal burden. But of course, that’s the point. Because like everything else the government does these days, the HOT lane project is ultimately about picking winners and losers. © 2014 Weekly Standard LLC. Reprinted with permission. Is this an example of government of, by, and for the people? On our current path, we’re headed toward the hollowed-out military of the 1970s.